SCVHistory.com LW3321 | St. Francis Dam Disaster | Initial Associated Press Wire Photo, Distributed 3-13-1928. 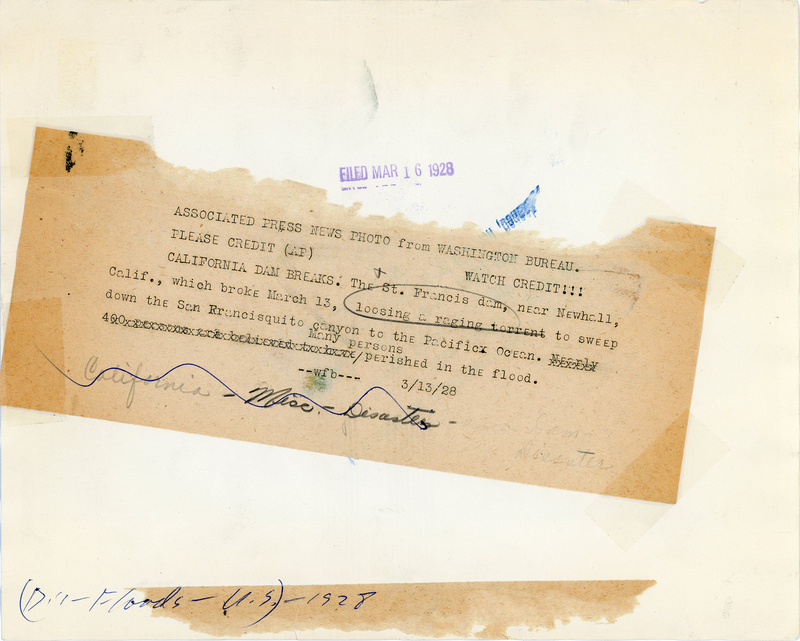 March 13, 1928 — Hours before it had its first photos of the dam disaster, the Associated Press distributed this image of the St. Francis Dam (probably from a Bureau of Water Works and Supply report) to announce that the City of L.A's dam "near Newhall" had failed. ASSOCIATED PRESS NEWS PHOTO from WASHINGTON BUREAU. PLEASE CREDIT (AP) WATCH CREDIT!!! CALIFORNIA DAM BREAKS. 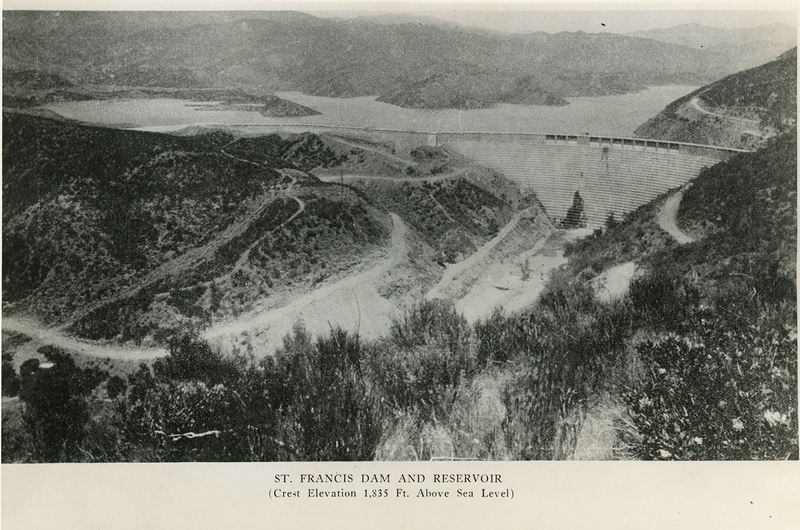 The St. Francis dam, near Newhall, Calif., which broke March 13, loosing a raging torrent to sweep down the San Francisquito canyon to the Pacific Ocean. Many persons perished in the flood. Technically it was still March 12 when the dam broke, but most of the death and destruction occurred on the 13th. Nearly 400 persons are believed to have perished in the flood. But a conservative AP copy editor crossed it out and changed it to "Many persons." In the days and weeks to follow, the death toll steadily climbed from the low 100s and eventually eclipsed the 400 figure. The consensus estimate stood at "more than 450" until the 2010s — nine decades later — when the Forgotten Casualties Project set out to identify (and quantify) all of the victims. As of 2018, the resulting estimate is 411 persons — almost exactly the same as the initial estimate on the morning of March 13, 1928, which evidently seemed too inconceivable to commit to print. LW3321: 9600 dpi jpeg from original photograph purchased 2018 by Leon Worden.